Dynamic Human Capital was named The Bob Pike Group International Licensee of the Year for 2013. 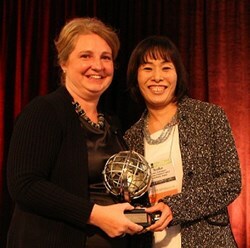 Ayako Nakamura accepted the award at a special luncheon in Minneapolis during The Bob Pike Group’s annual conference. Ayako continues to bring professionalism and credibility to participant-centered learning...She continues to excel while building her brand and growing her business. Ayako is just an exceptional businesswoman and trainer all around. Nakamura was certified in the Bob Pike Group Train-the-Trainer Boot Camp in 2007. Now, six years later, she has trained over 1,200 others in the participant-centered methods. DHC's Masako Yamamura has now also been certified in Boot Camp. For a business partner to be named international licensee of the year, they need to meet two of three criteria during the previous 12 months; continued sales growth, expansion of services through gaining additional certifications or attaining Master Trainer certification or achievement of quality as demonstrated by high average evaluations by participants or examples of client results at levels three or four in the Kirkpatrick model. “Ayako continues to bring professionalism and credibility to participant-centered learning," said Becky Pike Pluth, chairman and CEO of The Bob Pike Group. "She continues to excel while building her brand and growing her business. She also continues to exceed revenue goals. Ayako is just an exceptional businesswoman and trainer all around." “Ayako is a highly motivated individual who has vision as well as an attention to detail to see that things get done, and done well. I’m not surprised at the growth of Ayako’s company, and I expect continued excellence from her. It’s a joy to see her honored in this way as she shares her enthusiasm for this hands-on training methodology that transcends culture and increases training retention,” said Bob Pike, founder and chairman emeritus of The Bob Pike Group. The Bob Pike Group has provided trainer training workshops and consulting services to individuals and corporations for more than 30 years. Clients have been applying Bob's Participant-Centered Instructional System to build their learning organizations, to strengthen retention and to enrich desired results. For more information, contact Keith Baudin at 952-829-2653 or via email at KBaudin at BobPikeGroup.com or visit http://www.BobPikeGroup.com. Since 1979, over 300,000 clients have learned and used our Participant-Centered system - adult learning theory made practical and applicable.